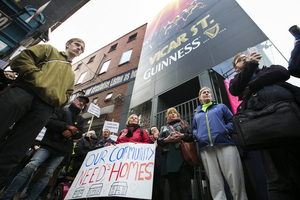 Residents at a protest outside Vicar Street music venue where there are plans for an eight storey ,185-room hotel (top). Locals say they want green space, homes and community facilities, not a high-rise building. All The Decent Heads Are Leaving Right So The Proclaimers More Floors, Vicar? 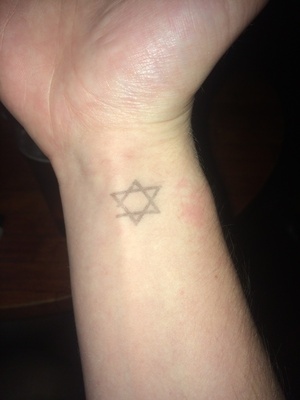 Posted in Misc and tagged Vicar Street at 10:20 am on February 18, 2019 by Bodger. all these hotels flying up all over the city are guna come unstuck in the future. Tourism is high, but it’s being maintained with the accom available at the moment. There’ll be lulls, global recessions, along with Dublin losing it’s allure (nothing but hotels and thusly only tourists, city loses it’s charm, locals are being pushed out to the suburbs) which will put dents in the visitor numbers in the future, and these hotels will be fairly empty, big eye sores and taking up real estate. It’s the typically blind Irish business model: something is popular, concentrate on it and it alone, harnass it and it’ll provide forever. . . and then it expires, like everything does. 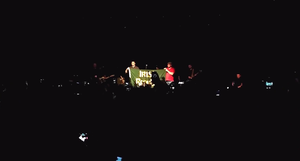 The irish are the greediest of the greedy, and the guys with the money will happily plough over history, and the future make-up of the city for a few quid. Overwhelming number of Amazon “tech workers” out in force against G-entrification and ethnic cleansing again…. I don’t understand this comment Dub Spot. Can you elaborate? No need to go down that route, especially in the liberties, there is an abundance of land around Dublin to build homes that are not high rise. If you are going to build high-rise, why not build it in the city centre, where people would rather live, and make best use of the scarce land available? Because there is plenty of land around, no need for high rise. That building looks to be 7 stories, so hardly high-rise – building any lower in the middle of the city is madness, IMO. wtf are you on about. I just said there is plenty of room around, as in that area, as in my area. I’d rather Corpo, sorry social houses built than manky apartments. So yes – not in your back yard. Why would social (or indeed private) two-storey houses be built in the city centre – daft under-utilisation of land when we are in the midst of a housing crisis. Some where to park their horses? It’s building on an already existing entertainment venue. If they don’t go ahead, there are still no new properties being built. It’s not pushing anyone out of the area. But by going ahead, there are additional jobs in short and long term. It might even tidy up the surroundings of the venue and encourage similar in the area. I’m not unsympathetic about the noise and disruption from the construction period, but surely that is expected in the city? Hopefully it’s done at reasonable hours. dude, look at the plan. that is not the existing building. 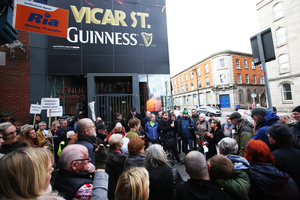 it’s incorporating lots of the area behind it, which is currently sheds and storage, not owned by vicar st.
How are they going to build on them if they don’t own them? If it’s is the sheds and yard that I am thinking of, it does belong to the venue. 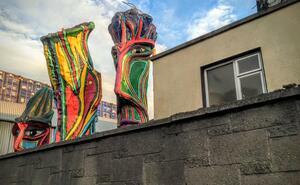 it belongs to the council, who used to lease it out to locals who kept horses n stuff there, but they sold it to vicar st. 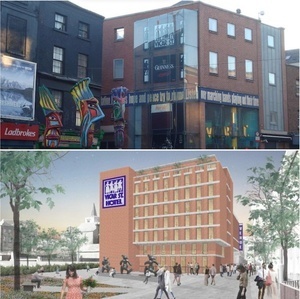 The point here, is that they didn’t need to sell it to vicar st., they could’ve used it for housing, green space etc. Isn’t there green space in the mocked up image? Does that not count? Genuine question. Luxury hotels are not a tourist priority. Dublin’s hotel prices are far too high. The capital needs more B & Bs and more room-only one- and two-star hotels. Just look at how the acute shortage of moderately priced hotel rooms has been met by the mushrooming of Independent Hostels. More and more twentysomethings and thirtysomethings – and older people – are willing to share dormitory rooms with strangers in the independent hostels, because they simply cannot afford to stay in hotels. 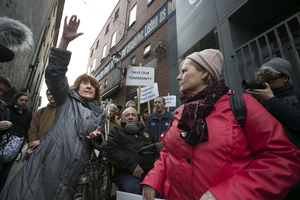 The working class people of the Liberties and elsewhere know that property speculation endangers their communities. Any government that leaves ‘urban development’ to ‘the market’ is abrogating its responsibilities and contributing to spreading urban problems. Loads of space around that area, sure half the Guinness buildings are derelict? 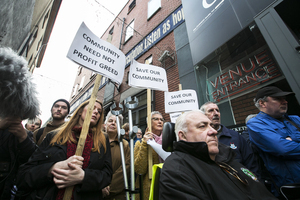 Short-sighted NIMBYs, the hotel will help gentrify a disadvantaged part of Dublin which suffers from rampant crime and drugs. 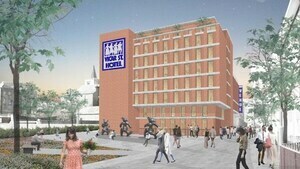 The hotel will help attract investment, housing development and facilities which will benefit the locals. But you just can’t help some people, thickos be thick. You are clearly not from the Area. Rampant crime and drugs might be where you live, but its certainly not in that area. Drugs and crime are SERIOUS issues in the neighbourhood. You must be living under a rock. Drugs and crime are an issue every where. I’ve been living here all my life, so I can state for a fact RAMPANT is way over the top. No why do you ask? Because that part of the city is beset with drugs, and all of the associated problems. Again you clearly don’t live here, its no worse than any other area. In fact I know much worse areas. I live in the area too and you may just be so used to it that you can’t see it. It’s like a Zombie apocalypse. Have you outside in Lidl Thomas St. recently? All the way from Merchant’s Quay up and surrounding area drug dealing and taking is quite open. Agree. Plus there is a new development of student accommodation almost completed a little further up. Great to see the gradual improvement of Thomas, Meath and Francis streets over the past few years. Good for all who live, work, study and play there. ‘help gentrify’…. Eh, you sure you meant to use that word to support your argument? There is a large swath of the population that thinks that gentrification is by and large a good thing; the main reason that people take issue with it is when it is one race displacing another. Has anyone actually looked at that area? This is the area that the new hotel will be in https://goo.gl/maps/17Uui1RcTpM2 A completely ugly carbuncle of a backstreet surrounded by hideous social housing one side only. I think that an 8 story modern building here would be a big improvement on what is there already. I live in the liberties and while there are alot of good people there we have a vocal majority who feel that you can be one km from St Stephen’s green and Phoenix park and yet still should have football pitches, allotments and green spaces “for the children”. It makes no sense whatsoever- what they really want is more social housing to be built so that their kids can live close to their flats and that is not going to happen so they protest against every development announced. It’s getting very tiring. You clearly dont live anywhere near Vicar street, thats clear from your comments.There needs to be social housing built because that’s what the area needs. It does not need a another hotel. Is that the site? Definitely looks like it could do with a park and not a high-rise hotel. It’s an old factory or warehouse where the horse carriages you see around the city keep their horses and stuff. The place is an eyesore.